Visionary science fiction writer Sir Arthur C Clarke, author of more than 100 books, has died at the age of 90 in Sri Lanka. His ideas and gadgets engaged his readers because of, not despite, their plausibility. Quite often, his fictional musings formed the basis of what we now see as science fact. 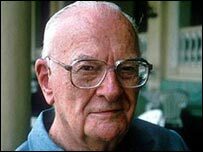 Arthur Charles Clarke was born in Minehead, a town in Somerset in the south-west of England, on 16 December 1917. A youthful interest in dinosaurs and Morse code blossomed into a fascination with all things scientific. During World War II, Sir Arthur volunteered for the Royal Air Force, where he worked in the, then highly-secretive, development of radar. Demobbed at the war's end, he went to King's College, London, where he took a First in maths and physics, before becoming a full-time writer in the late 1940s. He wrote story-lines for the comic-book hero, Dan Dare, inspired Gene Roddenberry to create Star Trek and posited Clarke's Law: "Any sufficiently advanced technology is indistinguishable from magic." 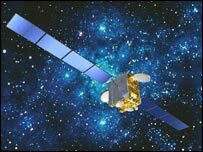 Beyond this, during the war, he published a paper in which he predicted that, at 22,000 miles above the Earth's surface, communications satellites would sit in geo-stationary orbit, allowing electronic signals to be bounced off them around the globe. His vision, soon proved, revolutionised the communications and broadcasting industry. No wonder, then, that Sir Arthur counted both Rupert Murdoch and CNN founder Ted Turner among his friends and acolytes. But it was his creation, with the legendary film director Stanley Kubrick, of 2001: A Space Odyssey, that brought Sir Arthur world-wide fame. Based in part on his short story, Sentinel, the film quickly established itself as a cult classic. 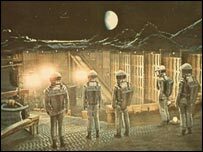 Its mysterious monoliths, the psychopathic Hal 9000 computer and a final sequence which baffled many cinema-goers have become frequently-referenced icons of cinema. He lectured, was feted by everyone from the astronaut Buzz Aldrin to R Buckminster Fuller, inventor of the geodesic dome, and appeared on television, most notably in Arthur C Clarke's Mysterious World. Sir Arthur's private life was as off-beat as his books. He moved to Sri Lanka - then called - Ceylon, in 1956. There he lived with a business partner and his family, scuba-dived and played table-tennis with local youths. He only married once, to Marilyn Mayfield in 1953. According to his entry on Who's Who, the marriage was dissolved in 1964, and Sir Arthur never had children. Sri Lanka's Justice Minister Lakshman Peiris ruled there was insufficient evidence to prosecute. A seer of the modern age, Sir Arthur was an original thinker, a scientific expert whose tales combined technology and good old-fashioned storytelling and whose influence went far beyond the written page. Marking his 90th birthday last year, he told fans: "I want to be remembered most as a writer. I want to entertain readers and hopefully stretch their imaginations as well. "If I have given you delight by aught that I have done, let me lie quiet in that night, which shall be yours anon."